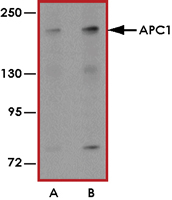 Sample Data :Western blot analysis of APC1 in SK-N-SH cell lysate with APC1 antibody at (A) 1 and (B) 2 ug/mL. 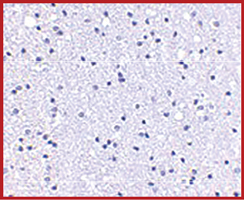 Sample Data :Immunohistochemistry of APC1 in human brain tissue with APC1 antibody at 5 ug/mL. 1. Yu PW. etal: Identification of RIP3, a RIP-like kinase that activates apoptosis and NFκB. Curr Biol. 1999;9(10):539-42. 2. Peters JM: The anaphase promoting complex/cyclosome: a machine designed to destroy. Nat. Rev. Mol. Cell Biol.2006; 7:644-56. 3. Jorgensen PM et al: Characterisation of the human APC1, the largest subunit of the anaphase-promoting complex. Gene2001; 262:51-9.